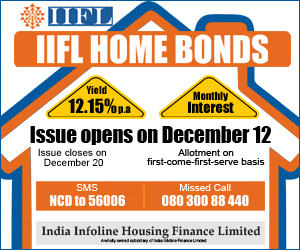 IIFL one of the largest financial service company in India plans to open IIFL home bonds NCD on Dec 12, 2013. The NCD issue is 250 Cr with option to retain over subscription of additional 250 Cr aggregating to a total up to 500 cr. Let’s checkout features of IILF Home Bond. This is the fourth issue from IIFL Group in the last 3 years. Looking at first glance with 12.15% yield & 11.52% coupon is very lucrative offer but we should look at return on a post-tax basis. For someone in highest tax bracket 30% this coupon rate of 11.52% will reduce to 8.12% post tax. For tax bracket of 20% it will reduce to 9.6% post tax and to 10.36% for 10% tax bracket. Post tax return is slightly higher compare to FD. We recommend you to invest in this NCD only if you are falling under lower tax bracket (10% slab) and happy with return of 10.36%. If you enjoy reading this post, do share with your friends on facebook and twitter!